Which of the candidates' energy plans will play in Peoria? (Fortune Magazine) -- What senators McCain and Obama believe about U.S. energy policy matters - hugely. To fight global warming, the next President will oversee the transition to a new, green economy, which will result in one of the biggest business transformations of the 21st century and potentially one of the largest transfers of wealth since the creation of the income tax. Both candidates agree that a carbon cap-and-trade law is the best way to make industries reduce their emissions of carbon dioxide and other greenhouse gases that cause climate change. Under such legislation, Washington puts a cap on carbon emissions that is lowered every year, and creates permits allowing industry to emit greenhouse gases just up to those limits. McCain favors reducing America's carbon dioxide output to 60% of the 1990 level by 2050, whereas Obama sets his target at 80%. The trouble is, limiting greenhouse gases will raise energy prices, because industries are forced to pay for cleaner technology - a hard sell at a time gas prices have hit an average of $4 a gallon. Politicians like cap and trade - vs. a straight-forward levy on gasoline, coal, and other carbon fuels - because it is essentially an invisible tax and therefore has less chance of raising the ire of voters. Where the candidates differ most is over money. McCain takes a Milton Friedman-esque approach to energy that counts heavily on the private sector to figure out solutions to global warming. McCain would give away most of the carbon permits - currently estimated to be worth $100 billion a year, or a staggering $4 trillion between now and 2050 - to big energy producers. If the utilities and oil companies don't have to pay the government for their permits, McCain's thinking goes, they will have more to invest in carbon-reducing technology, and energy prices probably won't rise as much. 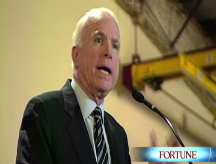 Obama's camp attacks McCain's program as a huge government giveaway. Says Jason Grumet, Obama's principal advisor on energy and the environment: "McCain, in contrast to his self-description as a fiscal conservative, would give hundreds of billions of dollars of emissions permits away to the energy industry in the hope that they would pass the savings on to consumers." 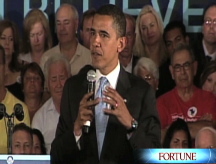 By contrast, Obama would auction 100% of the carbon permits to industry. Some of the $100 billion raised annually would go to low-income Americans to buffer the shock of rising energy prices. Some would fund green R&D and speed the commercialization of solar, wind, and other green tech. Because it funds aggressive federal clean-tech programs, Obama's version of cap and trade is more likely to help the nation meet its global warming goals. Yes, McCain would also auction off some permits to raise money for similar uses, but he hasn't made clear exactly how much money he would raise and when that might happen - it could be years. Obama's plan does have a weakness, which McCain's supporters are quick to point out. The $100 billion pouring into the U.S. Treasury annually would be mother's milk to special-interest groups. A chunk of the money, for instance, would be earmarked for green-collar training - whatever that is. Senator John Kerry has suggested that federal funds be used to protect New England's lobster industry from the effects of global warming. Says Douglas Holtz-Eakin, McCain's senior policy advisor: "There's no reason to turn this into a big cash cow for the federal government." And he's right. Once low-income citizens, green R&D, and the business incentives have been taken care of, the rest of the revenue should be returned to the U.S. taxpayer, which could help offset some of the drag on the economy that cap and trade is likely to create. And even better, cutting taxes would make such a bill easier to sell to the American people.